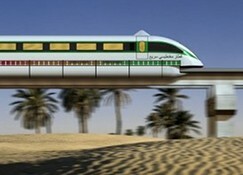 According to the 2009 original masterplan the Abu Dhabi Metro should be opening in 2015. But that launch date is already running behind schedule with revised plans now aiming for 2016-17, a pretty wide window and a longer wait than expected for passengers. This week bidders for the $2 billion metro and tram system will submit their statements of intent, reports the Middle East Economic Digest. Those in the running for the job include Siemens, Bechtel and Samsung. Prequalified companies will then be invited to submit a full bid by next March. The metro and tram was a victim of the government project freeze a couple of years back. There was a wobble in official circles and spending plans were comprehensively reconsidered in the wake of the global financial crisis, though most projects emerged pretty much intact, if delayed. Costs for the metro will be higher than the tram because it will mainly run underground. Phase one of the metro will cover the 18 kilometres from Zayed Sports City to Mina Port with 17 stops. The trams will run on two lines: the 15 kilometre-long blue line will run from Marina Mall to Reem Island and the 13 kilometre green line from the Central Bus Station to Saadiyat Island. However, Abu Dhabi looks pretty sure to beat Doha in commissioning the next metro in an Arabian Gulf State. Dubai got there first a few years back. Construction contract awards for the first phase of the Doha Metro worth $8 billion were announced yesterday with completion slated for 2019. Clearly there is something of a public transport revolution going on in the richest states of the Arabian peninsula. Such infrastructure contributes to the economic efficiency of these economies and is a very long-term investment. From being dusty Middle Eastern cities Dubai, Abu Dhabi and Doha are spending billions to transform themselves into modern metropolises. Dubai is really already there with its metro and now half-completed tram system. The benefit of being the latest cities to acquire public transport is that you get the very latest in technology and do not have to put up with a 100-year-old tube like London or Paris. You get to travel in air-conditioned comfort at high speeds.